With driver-level external GPU support, AMD plants the seeds for supercharged gaming laptops. AMD is hoping to capitalize on the external graphics card phenomenon with its latest Radeon driver update. Radeon Software 16.3 includes a new technology called AMD XConnect that allows for a seamless plug-and-play connection between laptops and external GPUs. If you have a laptop with Thunderbolt 3 input, AMD’s driver could allow you to connect an external GPU and enjoy the added gaming power without having to reboot the machine. For now, the only external GPUs available are tied to specific laptop brands, such as the Alienware Amplifier and MSI Shadow. 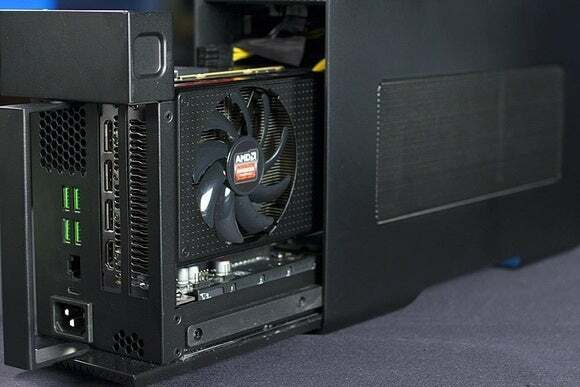 But a couple months ago, Razer announced a manufacturer-agnostic enclosure called Core, which can stash any graphics card up to 375W TDP, and connects to any Thunderbolt 3-equipped laptop. AMD says it worked closely with both Razer and Thunderbolt to make XConnect work. Beyond just plug-and-play convenience, AMD’s software also includes some management tools for gaming with an external GPU. From the system tray, users can quickly view any applications that are using the added graphics, close those applications, and safely disconnect the card. The laptop also remains running if users unplug the Thunderbolt cable without disconnecting the software first, though the software itself may crash when you suddenly yank out the graphics card. Keep in mind that XConnect has some other requirements beyond just the external GPU and Thunderbolt 3: Users must be running Windows 10 Build 10586 or later, and need a 40Gbps Thunderbolt 3 cable. The laptop must also support BIOS ACPI extensions—you’ll have to check with your vendor on that, or pray for a BIOS update—and the graphics card must be a Radeon R9 300 or Fury series. 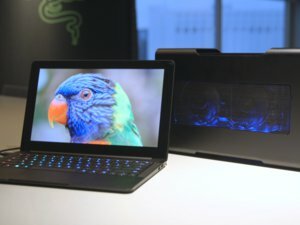 The impact on you at home: Given XConnect’s stringent Thunderbolt and BIOS requirements, most laptop owners won’t be able to start using external graphics even when the Razer Core hits the market. But as with any cutting-edge gaming tech, XConnect capabilities will surely trickle down to more laptops over time. 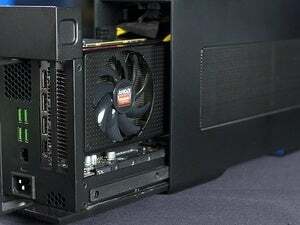 AMD is putting the pieces in place now so that connecting an external GPU will require minimal effort down the road.